On the eve of the Year of the Priest, you can see various celebrations recognizing the witness of priestly service in dioceses, religious orders and abbeys. The Benedictine monks of Saint Mary’s Abbey (Morristown, NJ) recently celebrated the 50th anniversaries of two monks. 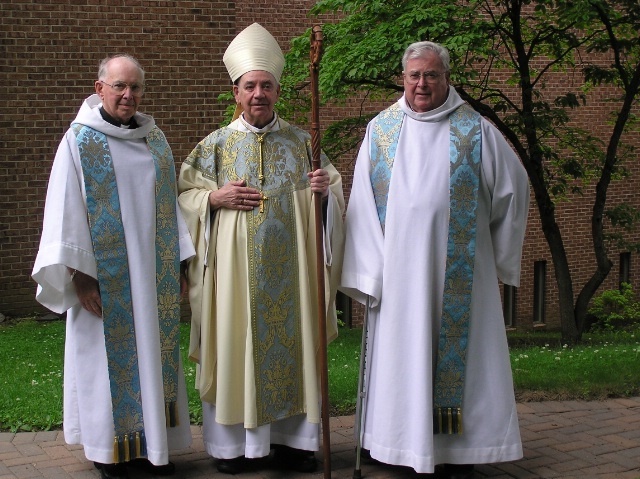 In the photo you see Abbot Giles Hayes with Reverend Fathers Rembert and Beatus. Both monks have served the Lord and the Church for a long and courageous time. Both Father Rembert and Father Beatus have witnessed to Jesus Christ and his mercy in a variety of ways that have touched the minds and hearts of many people. Let me say that I enjoyed Father Beatus’ preaching and his appreciation of art through history, culture and faith. Let us pray for these two monks and for all priests. unfaithful to their exalted vocation and have gone astray. Amen.